Marsh milkweed is the 2015 plant of the year. It is extremely valuable to pollinators and monarch butterflies. Honey bees, bumble and other wild bees, wasps, flies, butterflies and more rely on nectar from marsh milkweed. It matures in August & September, blooming profusely and with lush foliage. Female monarch butterflies readily seek out the foliage on which to lay their eggs in late summer. 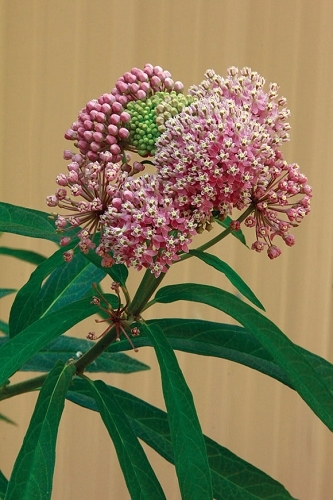 Marsh milkweed is a back-of-the-bed plant, rating 2 stars in our four-star system for formal gardens. Plants can reach four to five feet tall and equally as wide. The stems arch outward from a six- to eight-inch base. 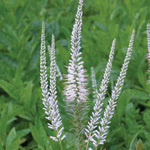 It is best to place this plant toward the middle or the back of a flower bed. It is a relatively short-lived perennial (two to five years on average), but it is well worth the effort to include in your home landscape ecosystem. As its name suggests, plants prefer soil that remains moist most of the summer. If you plant them in areas of average moisture, be sure to water them during dry periods. Marsh milkweed does best in full sun, though we have a four- to five-year old plant that only receives direct sun for a few hours in the morning, and it is going strong. If benefit to monarch butterflies is what you're after, it is important to use several milkweed species to ensure foliage is available for egg laying from late April into October. All four generations of monarchs are produced in Missouri with the fourth generation being the one that migrates. More than just a pretty face, marsh milkweed will add showy pink flowers to your landscape while providing nectar for a myriad of pollinators and critically important food for monarch caterpillars. While not the most attractive plant, it is attractive enough, has good height and does not flop-over (big! plus in my book). Flowers are very pretty (IMHO) and Monarch's seem to love them. Surprisingly drought tolerant once established. 2015 Plant of the year! Q: If I'm saving swamp milkweed seeds from last year's pods, do they need cold stratification? A: Seed dormancy can vary from year to year, but a fair percentage of milkweed seed will typically germinate without cold stratification. Germination success rates can often be increased with at least two weeks of stratification.